Successful marketers aren’t born overnight. It takes grit, determination and hard work to navigate your way from noob to expert. Additionally, the experiences that you have and the lessons you learn outside of the marketing field can impact how you look at and approach your marketing. 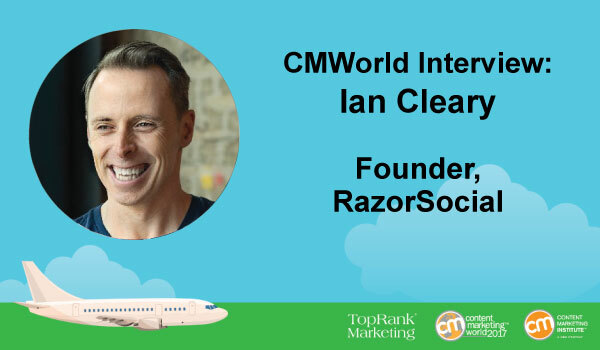 A shining example of someone that has built a successful marketing career after working in a vastly different field is none other than RazorSocial Founder, Ian Cleary. Like many speakers at Content Marketing World, Ian is a delightful mix of marketer and technology expert. I was able to catch up with Ian recently and gain some insights into his past in the software industry, his favorite marketing tools and his taken on building an engaged community. How do you think your experience in the software industry has guided your career as a marketer? Yes it certainly has. I had 15 years working in technical roles in the software industry prior to becoming a marketer and having all that technical knowledge and capability helped a lot because of how technical marketing has become. It took me a while to get comfortable being called a marketer!!! What inspired you to start your current company, RazorSocial? I had a failed software startup and I wanted to build an international company but I didn’t have an idea for another piece of software! So I decided to build a blog and then build a business around this. Now I get a chance to do content marketing consultancy and training with a lot of global brands and get to speak at conferences around the world. Who ever thought content could be this powerful!!! As someone that creates and shares a lot of content about which tools to use (and how to use them) what are a few of your favorite content tools and why? SEMRush – This is a great SEO tool. I use it quite often for competitor and keyword research and for identifying issues on my site. Buzzsumo – When I want ideas for creating or promoting content I use this. Agorapulse – when you create great content you want to distribute it to social channels. This is my tool of choice for social media management. Optinmonster – When I get visitors to my content I want to build email subscribers and there’s no better tool than Optinmonster. What is one secret to building an engaged online community? You need to deliver what your audience has a hunger for and to get engagement you need to engage. An engaged community is when your audience feels they have a relationship with you and a relationship is built through conversation. What are the 3 most important things marketers need to do to create a memorable content experience? Provide content relevant to the audience. What do you see as the biggest content marketing opportunity that many marketers aren’t taking full advantage of? Doing more outreach. We create all this content and share a lot on social media but we don’t do enough to reach out to build relationships, promote content and generate leads. In your presentation at Content Marketing World you’ll be sharing insights into how marketers can better utilize content marketing tools to optimize their results. Without giving it all away, what will attendees learn from your session? The 3 things they will learn and tactics, tools and tips. I always like delivering a practical session where you’ll leave the room with action items to implement. Which speaker presentations are you looking forward to most at Content Marketing World 2017? I am looking forward to so many. Here are a few. Jay Acunzo, Jay Baer,Andy Crestodina, Andrew Davis, Chris Goward, Ann Handley, Mark Schaefer, Donna Moritz, Pierre-Loic Assayag, Jon Burkhart and Michael Brenner and Deana Goldasich. There are so many great speakers at the event. Thank you for sharing your marketing insights Ian! If you’d like to learn more from Ian and 11 of his fellow Content Marketing World speakers, check out the second eBook in our series, The In-Flight Guide: Creating a Memorable Content Experience. For more from our CMWorld flight crew, see our recent interviews with Ann Handley, Adele Revella and Amanda Todorovich. The post CMWorld Interview: Ian Cleary Talks Technology & Engaged Online Audiences appeared first on Online Marketing Blog – TopRank®.